Gov. Mike DeWine delivers inauguration address at the Statehouse earlier this month. Gov. Mike DeWine’s administration is preparing to roll out his first proposed budget, which will likely include several big agenda items. DeWine says he doesn't plan to drop any big surprises into his budget plan, noting that he's already set into motion several major initiatives, such as supporting early childhood programs and addressing the drug epidemic. “We’re doing a few things at once, it’s coming along, we’re at the process now where we’re asking every agency and every department to give us their kind of their wish list, what do they want,” says DeWine. The budget process typically dominates the legislative calendar at the Statehouse until it’s signed, which must happen by June 30. 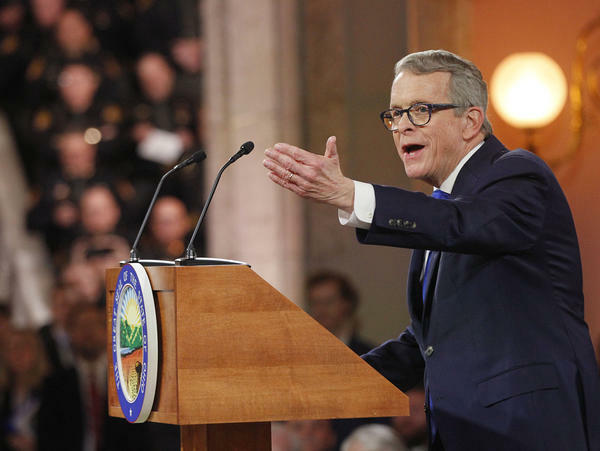 Because he’s a newly sworn-in governor, DeWine has until March 15 to deliver his budget proposal to the Ohio General Assembly. Gov. Mike DeWine and leaders of his program to fight opioid abuse are meeting with local advocates from around Ohio to share ideas. More than two dozen nominated state agency directors gathered for Republican Gov. Mike DeWine's first cabinet meeting, where DeWine emphasized a mentality of public service. Gov. Mike DeWine signed an executive order that extends protections and access to resources for victims of domestic violence. The order includes protections to victims in dating relationships and intimate relationships.